This study proposes an extension of the realized stochastic volatility model by incorporating realized quarticity RQ into the volatility process. We employ an efficient Riemann Manifold Hamiltonian Monte Carlo method in a Markov Chain Monte Carlo algorithm to estimate parameters that could not be sampled directly. We investigate the empirical performance of the proposed model using data for six equity indices and 24 individual stocks listed on the Tokyo Stock Exchange. Parameter estimates and two Bayesian model selection criteria reveal evidence supporting RQ-based models that are driven by the maximum value of RQ data. That model consistently outperforms benchmark realized stochastic volatility models in capturing spikes in volatility caused by large RQ values. 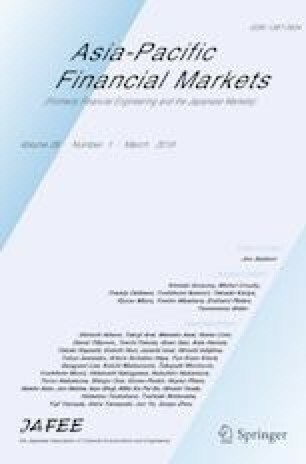 Including such stylised facts as the asymmetric effect of returns-volatility and heavy tailed returns, our results reveal that the proposed models exhibit a weaker correlation between stock returns and volatility and heavier tails in equity returns. We are especially grateful to Professor Hiroki Masuda of Kyushu University for his profound insights and numerous valuable suggestion. This study is partly supported by JSPS KAKENHI Grant Number 18K01554.